Federal employees narrowly avoided a shutdown this week, with lawmakers passing another short-term spending bill to tide federal agencies over into the new year until Jan. 19. Congressional negotiators still must reach a deal to raise budget caps that currently restrict the top-line spending levels for the remainder of fiscal 2018, however, and they are eyeing federal employees to help them pay for the funding increase. Congressional leaders are debating what is likely to be a two-year budget deal to avoid a sequester of appropriated funds, through an amendment to the 2011 Budget Control Act. According to several individuals with knowledge of those conversations, lawmakers are considering cuts to the federal workforce’s pay and benefits to offset the new spending. Current caps restrict spending to $549 billion for defense and $516 billion for non-defense agencies in fiscal 2018. Republicans are seeking to raise that number to $640 billion for defense, a figure Democrats have said they would agree to only if domestic agencies receive an equal increase. Wherever the new figures wind up, federal statute requires Congress to find ways to decrease federal spending in equal amount to any breach of the caps. “For the immediacy of the budget deal, feds are on the table,” said Matt Biggs, legislative director of the International Federation of Professional and Technical Engineers, which represents thousands of federal workers across government. Jessica Klement, the legislative director for the National Active and Retired Federal Employees Association, noted that Congress has frequently in years past cut feds’ compensation to pay for other spending. Dozens of lawmakers are also starting to sound the alarm on the issue. Eighty-five House members sent a letter on Friday to leaders in both parties imploring them to spare federal employees as they negotiate a budget deal. A group of senators is currently working on a similar letter to send to leadership in their chamber. “While we agree that a long-term bipartisan budget agreement to lift the devastating sequestration caps is necessary, to finance such an agreement on the backs of middle class federal employees who have dedicated their lives to serving our nation would be wrong under any circumstances,” the House lawmakers wrote. 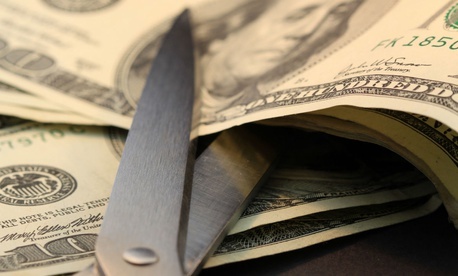 They estimated feds have seen their pay and benefits cut by $182 billion since 2011. A two-year budget deal struck in 2013 offset spending increases in fiscal years 2014 and 2015 in part by requiring new feds to pay 1.3 percent more of their paychecks toward their retirement pensions. A second, two-year deal agreed to in 2015 spared federal workers after speculation they would again be targeted. The Trump administration has already told agencies to plan for a governmentwide pay freeze in 2019 and has voiced support for reducing the workforce's benefits package. Federal employee advocates are planning to storm Capitol Hill after the new year to make their case that feds have sacrificed enough. They see not just the budget deal, but other spending measures, such as the infrastructure plan President Trump and congressional Republicans have identified as a priority for 2018, as a vehicle that could carry cuts targeting civil servants. “It’s going to be all hands on deck to protect feds’ pensions, feds’ pay,” Biggs said.